Cold and Flu season is here! So are the holidays! Discover great ways to boost your immunity and reduce your chances of getting sick this winter; even learn how to avoid the dreaded weight gain this season with a personalized action plan to keep you healthy through the holidays and feeling great going into the New Year! Do you have a sweet tooth that has you reaching for that candy bar or ice cream often? It’s not an easy task but you can break up with your sugar habit. Health and Wellness Coach, Amber Branson, will help you learn how to successfully stop the addiction and create healthy habits along the way! More details on how to sign up soon! Live a healthier, happier life by learning how to deal with stress effectively. Discover what stress is and identify your personal stress response. Class will also explore adaptogens and the role they play in stress reduction. More information on signing up coming soon! Kale may be one of the healthiest things you can eat but do you know how to properly prepare it for maximum flavor? Come learn how to make kale delicious and reap its many health benefits. Grills aren’t just for meat! Come learn the many ways to cook vegetables without the hot kitchen. From barbecued carrots to grilled salads, you will be sure to impress at your next cook-out. Running out of ideas on how to make the most of summer’s bounty? Learn how to use a spiralizer to make everything from vegetable “pastas” to cucumber salads and more. Handouts and recipes included. PLUS enter a drawing to win your very own spiralizer and a complimentary health coaching session. Vegetables donated by Double Star Farms, the sponsor of this cooking demo series. Join in on the cauliflower craze and learn how to use cauliflower as a low carb alternative. From pizza to stir-fry, it’ll be easy to get that extra serving of vegetable onto your family’s plates. Come try some tasty ways to use Cauliflower as a low carb substitution. Recipes and handouts included! Cauliflower provided by Double Star Farms, the sponsor of this cooking demo series. Put down the store bought dressing and learn how to step up those fresh spring greens with homemade dressings. From balsamic to Asian inspired, learn the trick to balancing flavors so that you crave a salad every day. Come by my booth for a quick demo, salad dressing tastings and take home some recipes! Spring Greens donated by Double Star Farms, the sponsor of the cooking demo series. FLUFF YOUR LAUNDRY ROUTINE WITH THESE NATURAL LAUNDRY BASICS! AMBER BRANSON, A HOLISTIC LIFESTYLE ENTHUSIAST, WILL DEMONSTRATE HOW TO USE COMMON INGREDIENTS FOUND IN YOUR HOME TO CREATE CHEMICAL FREE LAUNDRY DETERGENT AND STAIN REMOVER. PLUS, LEARN HOW TO CREATE WOOL DRYER BALLS, A NATURAL FABRIC SOFTENER. ALL MATERIALS PROVIDED. SPACE IS LIMITED; TO RSVP, EMAIL BROOKEB@LUCKYSMARKET.COM. Sugar and salt aren't just for the kitchen! Come learn how to make body scrubs and bubble bath using pantry staples and enjoy creating something that nurtures you inside and out. Leave with recipes and the knowledge to recreate for yourself. Perfect for Holiday gifts! Support Perennial and update your wardrobe for summer! 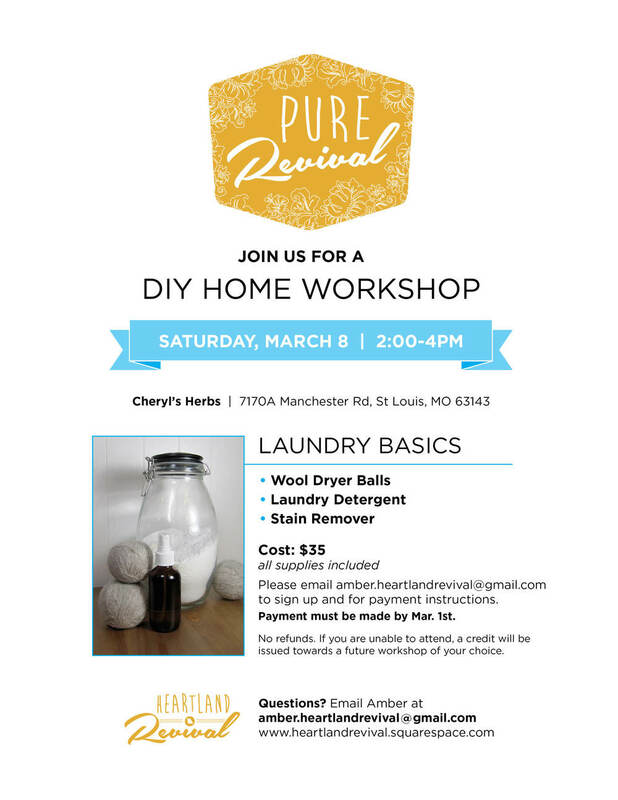 Heartland Revival will be there, providing sample laundry detergent for sale as well as a raffle basket that includes our natural detergent and stain remover as well as upcycled dryer balls. Grab a glass of wine or cup of coffee at the darling Cup 'N' Cork and learn how to create 2 natural, good-for-you body products. We will be making tub teas using herbs along with a face scrub using common kitchen ingredients. Sign up and pay below. Limited spots available, sign up now! Pure Revival is creative gathering featuring a selection of approachable, all-natural, DIY projects for household, body and pet products. Please bring the ingredients and alcohol you are planning to infuse. PLUS a drink/snack to share. Bottles for the alcohol are $2 each. (375ML/12.7 oz) Please message me your quantity by the 28th so I can order enough. Or you may bring your own bottles.